Grandparents may remember Bill Cosby as the racial-barrier-breaking co-star of the ’60s action series “I Spy,” or as a voice coming from a record player, talking about his brother, Russell, or re-enacting one of history’s first major naval construction requests. For parents, he’s likely part television icon, part advice-giver, part guy with the crazy marker. For kids, he’s mostly the stuff of legend and re-runs. But at 75, he’s still touring, and he still thanks his time in the Navy for helping shape his success. 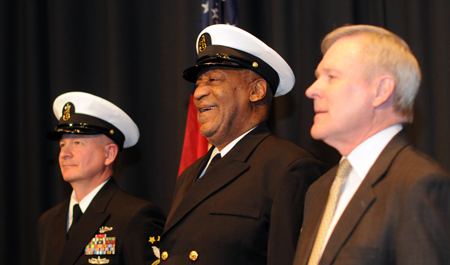 Cosby earned the Lone Sailor Award in 2010 and was named an honorary chief in 2011. Cosby was offered $200 to re-enlist for another four years, he said, and he went to a detailer to accept the offer. But the man talked him out of it. Had no idea about HM3 Cosby! My favorite routine has always been his “200MPH” monologue, about his replacing his Ferrari with a Shelby Cobra.